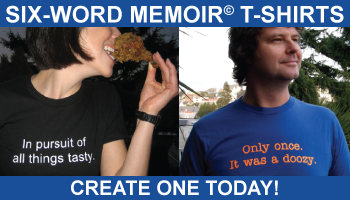 « Six-Word Memoir Sequel Preview: Zombies!!! I ran into indie rock star hero Jonathan Coulton when and where I usually run into him: in the wee(ish) hours of the morning at Gorilla Coffee, the Brooklyn institution that fuels more than a few entrepreneurial efforts. I’d beeen after him for weeks now, encouraging him, with increasing enthusiasm (some might say “aggression”) to write a six-word memoir for our next book. “I can’t believe you’re walking in here, Coulton,” I hassled him. “How can you face me without a six-word memoir in hand.” Even though he’s a former software writer, brilliant musician, and genius at the short art form, his excuse—”this is actually really hard”—was genuine. So I suggested he pull up a chair so we could hash it out. I put forth the tips Rachel and I always suggest: be honest, be specific, be authentic. Those who know Coulton, or read about him in a New York Times Magazine story about who today’s new breed of DIY rockstars, know that his unique relationship to his rabid community of fans is one of the things that define his life. So we talked about that. Then, as the caffeine kicked in, he had a breakthrough: “Why don’t I ask my Twitter followers to write my six-word memoir?” Coulton crowdsourced his six-word dilemma, and the results are awesome. “I tweeted my own server out of commission,” he emailed later, as his fans began buzzing about his short, short life story (quite a few of which discussed his hair). Check out what they came up with on Twitter, as well as on his blog (where you can also learn more about his music), where versions of this musicians’s short, short life story are still pouring in. 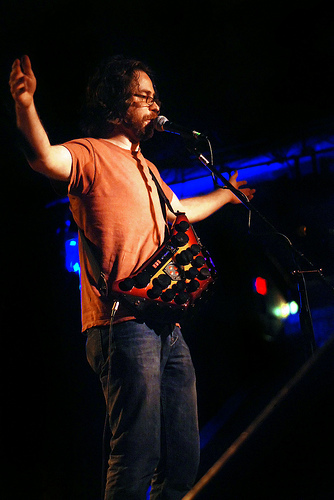 In six words: Jonathan Coulton: your crowd really rocks. Photo>>> Flickr user sophistechate >>Creative Commons. I roll with the geek rockers. Stop eating my brains, Jonathan Coulton. Fond of your musicality and fluency. I can’t stop eating your brains.